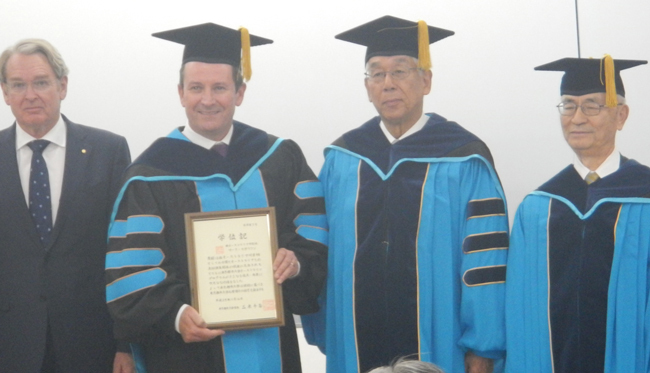 The Honourable Mark McGowan, Premier of Western Australia, and a delegation that included the Honourable Richard Court AC, Australia’s Ambassador to Japan, visited Tokyo City University (TCU) on 16 November 2017. Since 2015, TCU has sent more than 400 students to Edith Cowan University (ECU) in Perth as part of its TAP (Tokyo City University Australia Program), contributing to the friendship between Australia and Japan. Currently, nearly 24,000 students are studying at Edith Cowan University, three times the number of students at Tokyo City University, including 3,600 international students from over 100 countries who contribute to an international environment. In 2015, TAP started a unique Intensive English Course for teaching English, with students learning “pronunciation and conversation” in depth during their first year at TCU, and then studying at ECU for five months in the second year in a group of 100 TCU students. To date, 430 TCU students have experienced studying at ECU. Their average score in TOEIC tests has improved by 100 points, and at the same time they have gained an international perspective and improved their communication skills. Next year, nearly 300 first-year students currently in the Intensive English Course at TCU will spend time at ECU. Tokyo City University aims to expand the program to other universities in Australia, with the goal of sending approximately 500 students a year to study in Australia after 2020.